Lake Lansing Road Animal Clinic and Pet Resort tries our best to treat all patients. However, there are certain situations when we will have to refer our clients to the emergency center at the College of Veterinary Medicine, at Michigan State University. If it's after 6:00pm during the week or 12:00pm on Saturday or a Sunday please contact the small animal clinic at MSU at 517-353-5420. The clinic is open 24 hours a day 365 days a year. For further information, please visit MSU's website. 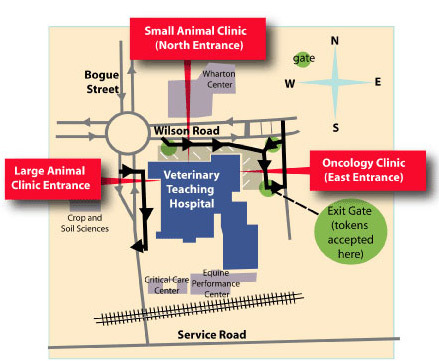 When will we ask clients to visit the small animal clinic at MSU? After Clinic Hours, Sundays and when we are busy with other emergencies. On rare occasions we may be too busy with current patients and it would be in your pet's interest to get immediate attention from veternarians at MSU. You suspect any broken bones. You think your pet might have ingested something toxic, such as antifreeze, rat poison, household cleansers, or any kind of medication that wasn't prescribed to her, . Your pet, particularly your male cat, is straining or unable to urinate. You can see irritation or injury to your pet's eyes, or she suddenly seems to become blind. Your pet's abdomen is swollen and hard to the touch, and/or she's gagging and trying to vomit. You see symptoms of heatstroke. Your pregnant dog or cat has gone more than three to four hours between delivering puppies or kittens.